I found another incompatiblity issue with Snow Leopard, this time it’s from a small company, you might have heard of it. I think they create a few computer accesory parts every now and then, an occassional keyboard, mouse and computer speakers. Ring a bell? The company I’m talking about is Logitech and they are not just any company, they are a huge company with 7,500 employees, producing products like the one mentioned above plus more. Logitech has also been my favorite maker for keyboards and mice for as long as I can remember. Keyboard-wise though, I switched to Apple when they released their new Alu keyboards. Up until then I’ve been using mostly Logitech UltraX which was great, an amazingly cheap keyboard with really good keys on it and not cramped with a ton of useless features and shortcuts. That’s why I’m flabbergasted to learn that Logitech is yet to release an update for their Logitech Control Center (LCC) software. In Snow Leopard, it doesn’t support the features of Exposé and Spaces, not out of the box at least – or if you upgraded from Leopard. I’ve heard of two possible solutions to this problem, the first one is the route I took and worked for me. You can change the “assigned action” within Logitech Control Center from the “Exposé, Dashboard & Spaces” you’re probably using right now, to “Keystroke”. 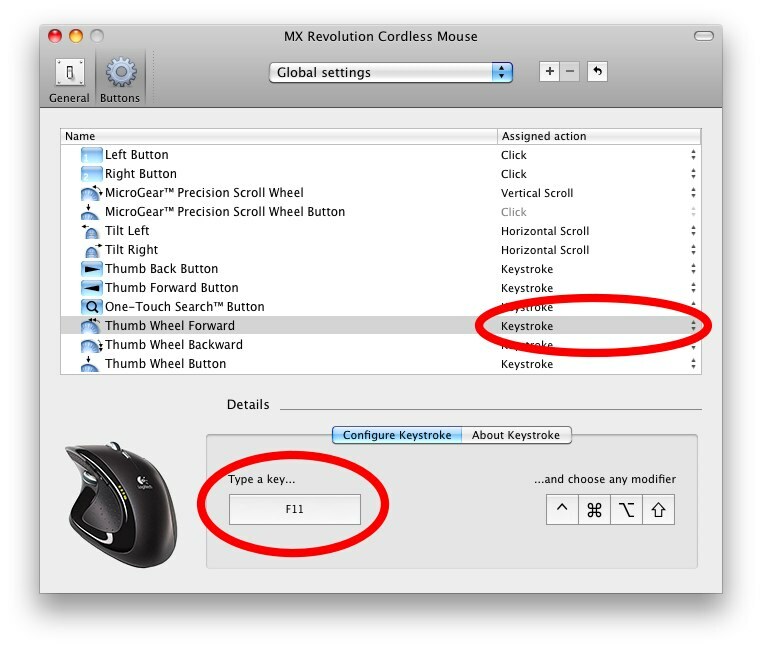 Now, in order to assign the proper F key the mouse button/wheel, you will have to remove that very F key assignment from within Exposé & Spaces in your Mac’s System Preferences, otherwise LCC cannot “capture” the key when you press it. So go to System Preferences > Exposé & Spaces. Pick one, say “All Windows” and remove the “F9” assignment (or whatever you have). Go back to Logitech Control Center, select Keystroke, click “F9” in the “Type a key…”-field. Go back to System Preferences > Exposé & Spaces and assign F9 to “All Windows” again. Test that it works by pressing the mouse button/wheel you assigned F9 to – it should work. Do the same for the rest of the exposé and spaces features you want. Another method I haven’t tried, but some users are reporting works for them as well, is copying (not moving!) the “Exposé” and “Spaces” applications from within \Applications\Utilities to just \Applications. You will have the applications twice on your hard disk, but that shouldn’t matter. I don’t know how well this method will work for you though, it doesn’t work for everybody. The second option works perfectly and can be done with a symlink. $> su # enter password for the account when prompted to. So there you have it, you can once again enjoy all the features of your Logitech mouse within Snow Leopard. I currently don’t use a MAC desktop, I use a MacBook Pro so I am at least happy with the fact that I won’t need to sweat this issue yet. I am still excited about the upgraded system. .-= Extreme John´s last blog ..Dumbest Twitter Sales Pitch Yet =-. You’re welcome, Andrei. Let’s just hope Logitech will get to work as soon as possible and release an update that works like the old one used to do under Leopard. I’m glad it worked for you – and thanks for commenting, Tobi. I’m using my “middle button” to hide windows, I always have a ton of windows open so the CMD+H shortcut on the middle button makes it easy for me to get windows out of the way that I no longer need. But Exposé is a great idea too. Thanks Eske, I’ve updated the post to include a direct link to your comment, so people can choose to do it with a symlink. Great guide. This works great! I just get “No Logitech Device Found” in LCC after snow upgrade. Very disappointed in logitech. No info can be found anywhere on their site. Yes John, it’s amazing why Logitech doesn’t provider more information – or just an update, it’s not like they couldn’t have known that Snow Leopard was to be released this fall, although it probably came out a bit earlier. Have you tried turning your computer on and off again and possibly trying your Logitech USB receiver in a different USB port to make sure LCC sees it? The first method you mentioned worked perfectly for me. Easy. Thanks. Apparently LCC 3.1 solves a lot of issues, but now I’m having big trouble on another front. Whenever I plug in my Anywhere MX mouse and then later log out, the computer hangs and eventually gets to a washed out looking log in screen. Can’t click on any buttons or enter password, and only hard reboot solves it. ONLY happens when I plug in mouse. My guess is buggy LCC daemon. Is this happening to anyone else?? Any suggestions?? I use Logitech mouse wireless MX Revolution and MX Anywhere. both have same problem when i want to customize Folder background. The mouse Stuck after I scroll then can’t click only can move. I already send email to Logitech Support but no answer. anybody know how to fix this problem? 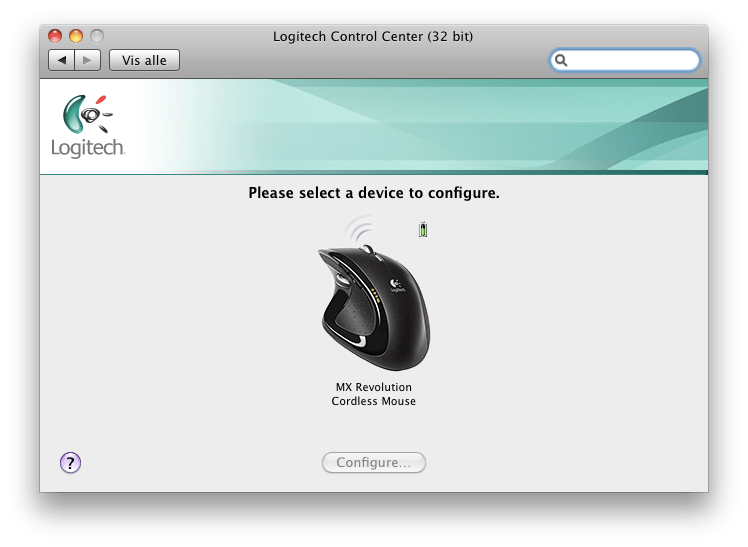 In LCC it shows as ”No Logitech Device Found”, although if I go into preferences -> mouse, ‘setup bluetooth device’, it acknowledges the mouse as logitech MX revolution. I have tried rebooting, & reinstalling the software again – no joy.